The US government needs to break free from the baleful influence of its Saudi, Turkish and Gulf Arab allies and embrace the Russian strategy of winning a full military victory by liberating Raqqa, retired US diplomat Jim Jatras told Sputnik. 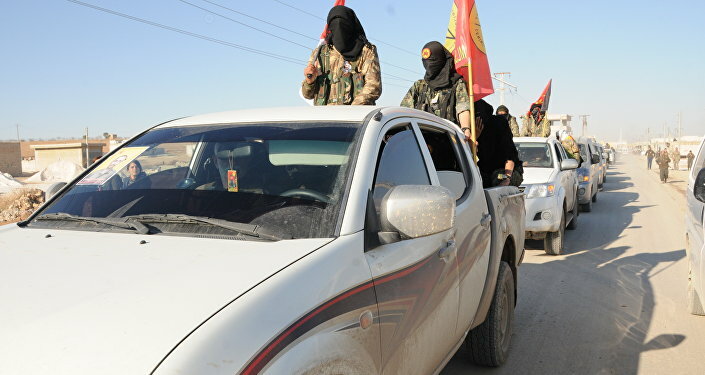 WASHINGTON (Sputnik) – Russian-backed Syrian forces are driving on Raqqa, the Syrian capital of Daesh, while US-supported rebel forces, including Syrian Kurds, are attacking too. “The argument that any attempt to eliminate Daesh requires a strategy to mobilize Arab Sunni sentiment against it [in accord with] Saudi Arabia, Iran and Turkey points to the same dead end that allowed the rise of Daesh in the first place,” he said on Thursday. US toleration and empowerment of Saudi policies had led to the rise of the Daesh in the first place in both Syria and Iraq, Jatras, who served as an adviser to US Republican senators for many years, explained. The US government still sought to protect the Syrian al-Qaeda affiliate known as the al-Nusra Front and such supposedly “moderate” terrorist groups like Ahrar ash-Sham despite their record of atrocities and cooperation with al-Qaeda, Jatras observed. Even if some military gains can be made against Daesh in isolation, the Obama Administration and its Middle East allies still want leverage for an eventual “regime change” outcome, which would mean preserving some sort of radical Sunni presence in Syria, Jatras explained. The Damascus government was not sectarian and most of the generals in the Syrian Army and most of President Bashar Assad’s Cabinet are Sunni, Jatras noted. The advance of the Syrian army towards Raqqa with focused Russian air support was a triumph for Moscow’s military strategy, Jatras insisted. The combination of carefully directed airstrikes in support of a well-organized and motivated professional army had already succeeded in liberating Palmyra and was likely to also succeed in both Aleppo and Raqqa, Jatras concluded.